D02-1013-408 Black Glass that typically comes with the D25LT as a bottom-of-scale standard. The D25LT typically comes standard with a D02-1013-408 Black Glass (100 mm x 100 mm; 4 in x 4 in) affixed to a metal backing plate, to set bottom-of-scale during the standardization protocol.However, in some factories, particularly food plants, there is a customer concern about possible glass breakage even with the metal backing. A02-1002-965 Light Trap is equivalent in function to the black glass and is used where glass is not allowed. 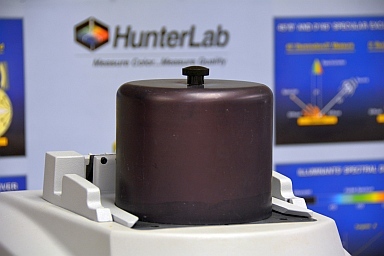 For customer situations where black glass cannot be used, HunterLab offers the A02-1002-965 Light Trap as equivalent in performance to the black glass for standardizing the instrument to 0% reflectance. 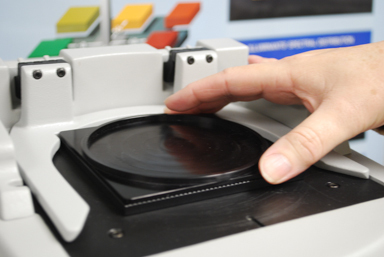 The black glass is the traditional bottom-of-scale instrument standard for directional geometry instruments such as the D25LT. It is also less expensive to manufacture than the light trap. HunterLab offers this light trap to address a specific customer concern with the D25LT Port Up sensor and have done so with previous sensors such as the D25L and ColorQuest 45/0 LAV.